British photographer Martin Pugh has won Astronomy Photographer of the Year – with a picture shot from his garden shed. The detail in Martin’s winning image, Horsehead Nebula, was described as ‘absolutely stunning’ by competition judge Chris Lintott, who presents the BBC’s Sky at Night. Martin’s picture beat 540 entries, the best of which have gone on show at the Royal Observatory in Greenwich, London. 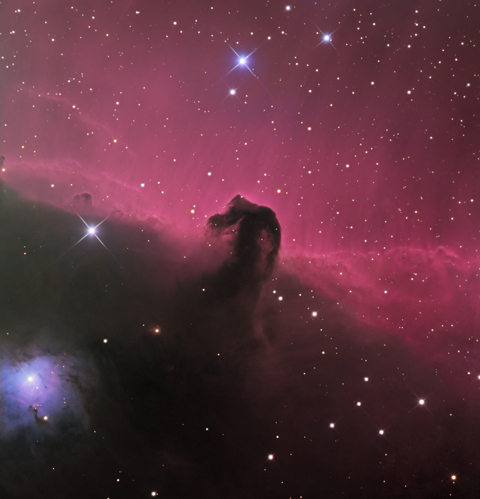 Horsehead Nebula is a dark cloud of gas and dust in the constellation of Orion – around 1,500 light years from Earth. Martin said he captured the image with a ‘CCD camera’ mounted onto a telescope in the garden shed of his home in Canberra, Australia. The photographer – who originally hails from Dudley in the West Midlands – said the picture was captured over 14 nights, using a total exposure time of 19 hours. The competition – in its first year – was run by the Royal Observatory, Greenwich and Sky at Night Magazine.